We’ve all heard it said that breakfast is the most important meal of the day, but did you know that 31 million Americans skip it every day? Show your employees you care by making sure they start their day off right and consider the benefits of catering breakfast for the office. The World Health Organization tells us that the right foods can increase brain productivity by up to 20%, so it makes sense that starting off with a good meal will boost overall productivity for the day. Providing your employees with these essential nutrients first thing in the morning is sure to yield better results throughout the workday (and if you need more convincing, read our blog post on the benefits of eating breakfast). Reap the benefits of a surge in office momentum while simultaneously starting everyone’s day off on a positive note. Add value to your company while showing your employees that you value them too. 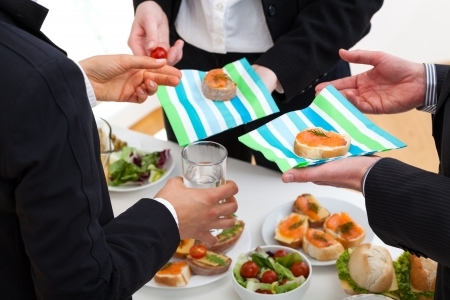 Scheduling an event over breakfast is advantageous for everyone. It requires nobody to take any extra time out of their day, which means more people are likely to attend a breakfast event. It’s a quick and easy option—you can hold it right in your office. This makes breakfast the perfect opportunity to hold a fundraiser, schedule a networking event, or hold a company meeting or training, even if you want to book an accommodating outside venue. Breakfast is a pretty versatile meal; simple doesn’t have to mean boring. There’s a lot of room to play around with options. Have employees with a sweet tooth? Add some fruity Danishes or chocolate chip pancakes. Dedicated gym goers that break a sweat before work? Try a fresh omelet buffet. What about those people who wake up with a small appetite? Offer some bagels or donuts. Whatever you do, just don’t forget the coffee. It’s hard to go wrong with a catered breakfast for the office. It’s a great way to show appreciation for your employees, and you can almost guarantee that people will be hungry. Let R & R Caterers ensure that your staff gets the delicious breakfast they deserve.